Homespun Stitchworks..... For the love of vintage: Book review .. Patchwork loves embroidery by Gail Pan. 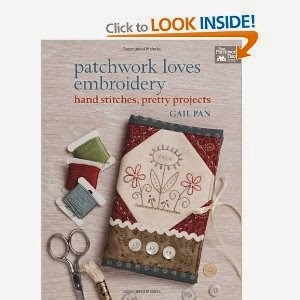 Book review .. Patchwork loves embroidery by Gail Pan. There a pretty pictures of all the makes and instructions for you to carry them out. You could either do it with new fabrics as it is in the book or use some vintage ones. Some of the ideas in the book would make a great gift for someone. A must for anyone who who like to start making their Christmas gifts for stitcher's in the family! You can buy it on Amazon if your local book shop does not have it or can not order it for you. Picture taken from Amazon for you to see what it looks like.